That can mean new levels of convenience, but it also raises important questions about privacy and who gets to see the data, and U.S. Secretary of Commerce Penny Pritzker is paying attention. 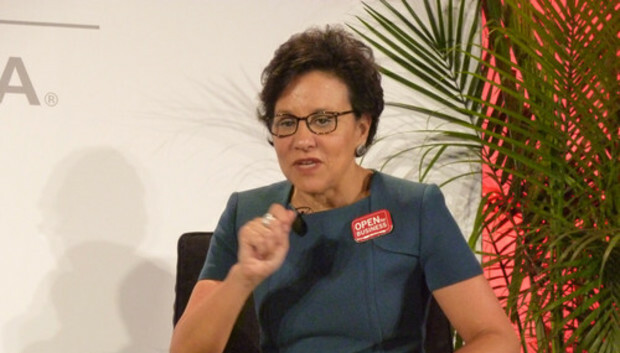 "I think we need to ... have a real look at the issue of privacy and where you draw the lines and what are the rules," Pritzker said in an interview with IDG News Service at the International CES expo in Las Vegas on Wednesday. "I don't think there is consistency or clarity right now ... in terms of what companies are collecting and what they can do with that data," she said. The issue was underscored for her, she said, when she toured CES and saw some of the gadgets on display, especially those associated with the "Internet of things." That's a catch-all term coined by the industry for devices such as home appliances, sensors and industrial equipment that can connect to the Internet and share information. Samsung's Smart Home project, for example, pushes data from air conditioners, refrigerators and vacuum cleaners to a server, where it can be accessed through a smartphone app. Belkin has an Internet-connected cooking pot that can similarly be controlled from afar via the Internet. So the next time you make a stew at home, someone far away might know what you're cooking up. "You say to yourself, 'Do I want everybody to know that? Do I want that [information] freely recordable somewhere else [where] I don't know what is going to happen to it?" she asked. "It raises, for a lot of people, questions, and I think we should have a conversation about it and I think that needs to sorted out." The issue of personal privacy was brought to national attention in the second half of 2013 when documents leaked by former National Security Agency contractor Edward Snowden revealed massive data collection efforts by the U.S. government to monitor Internet and telephone traffic in the U.S. and overseas. Pritzker said the Department of Commerce has been part of the discussion with the White House regarding the program. President Barack Obama is due to issue a report on the issue soon. She said they both share concern on privacy issues as far as the NSA is concerned and that needs to be one of the things weighed in determining the direction of future surveillance efforts. She said it should also be ensured that any surveillance is being carried out for a legitimate purpose.